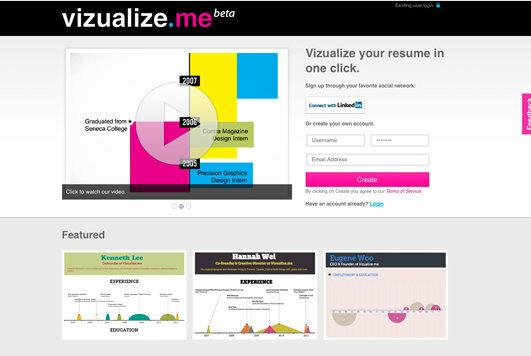 Check out a new service to create your resume. Visualize.me has a, free with options, offering that will help you to get started. Your resume will be displayed in an infographic. Various templates are available and you can customize to your heart’s delight. The service is free but has options to upgrade and get access to even more options and graphics. The question is what the potential employer will do with this novel resume. There are certainly areas where this resume will appeal to the recruiter, design firms will be one, smaller start up companies is another and there will be more probably. It is not sure if a bank will appreciate the departure from the good old resume format but you can always try and get some feedback. If they want differently formatted information you can always supply that later. A bigger problem will be the software used by many companies to parse the resumes and feed their talent selection system. These pieces of software may not work that well with this nice format and so you may need to manually enter all your information anyway. Certainly during an interview you will make a lasting impression when you provide an infographic to your interviewers and also on job fairs this may proof a great tool and discussion starter.